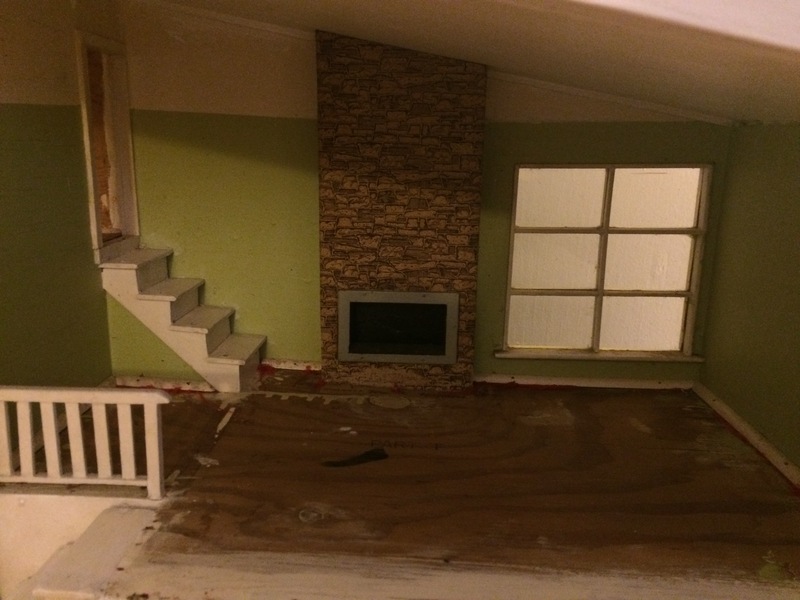 New to FlipThis(Mini)House? Here’s a recap for you! 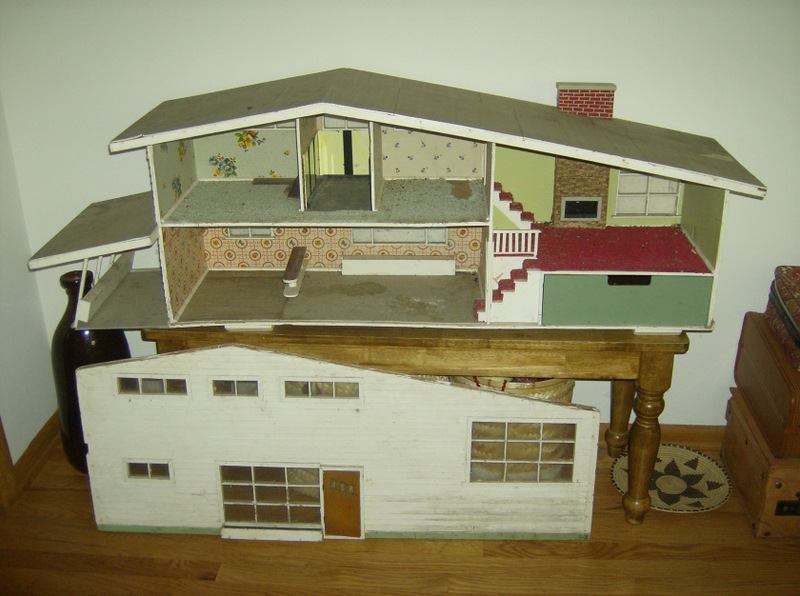 I’ve always loved dollhouses. 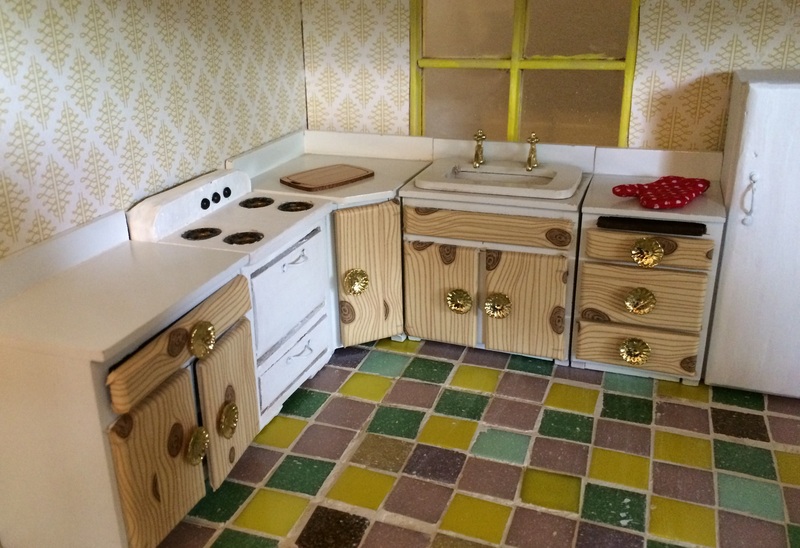 Last summer (July, I think) my friend and her husband spotted a mid century dollhouse at a flea market and sent me a text, asking if they should buy it for me. It was just $35, appeared to be pretty solid looking, and had an awesome, unique split level layout. Mini blinds made from a coaster. 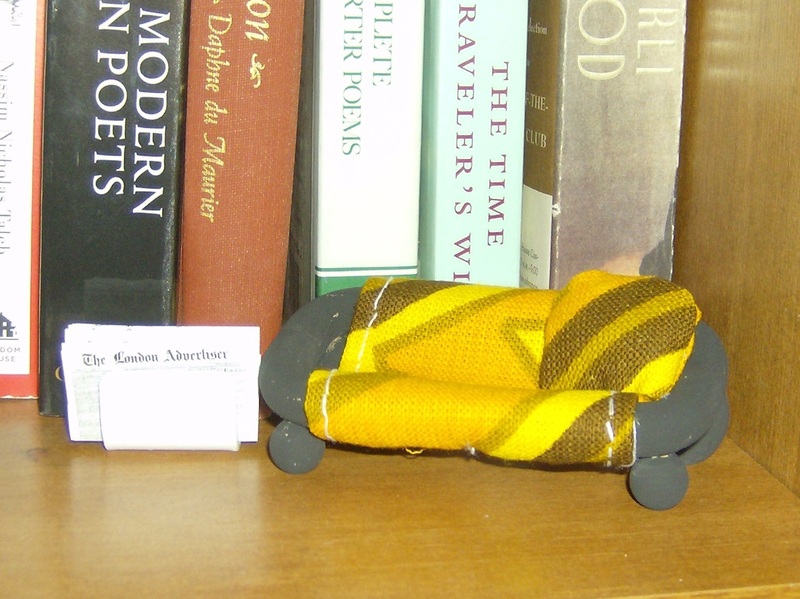 Tiny love seat made from two wooden handles, a mid century cloth napkin, and some small wooden balls. The tiny newspaper rests in a metal doodad from Habitat for Humanity Re-Store. 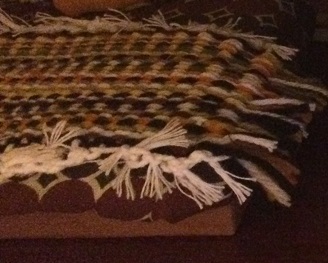 A small rug/blanket woven on a potholder loom. Photos by Holly Tierney-Bedord. All rights reserved. 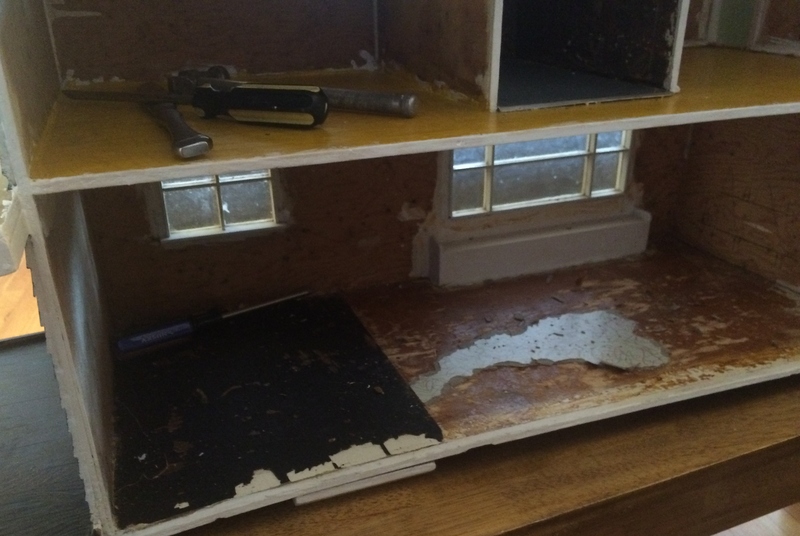 It took me months just to get all the wallpaper and flooring removed! 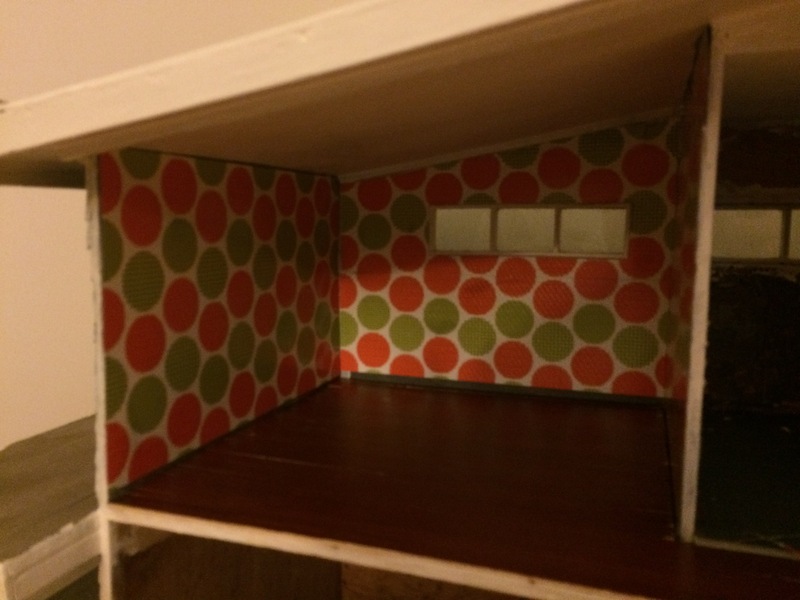 A look at my mini kitchen and dining area, in progress. Trying out furniture and decor in the living room. This kitchen is coming along! All photos by Holly Tierney-Bedord. All rights reserved. 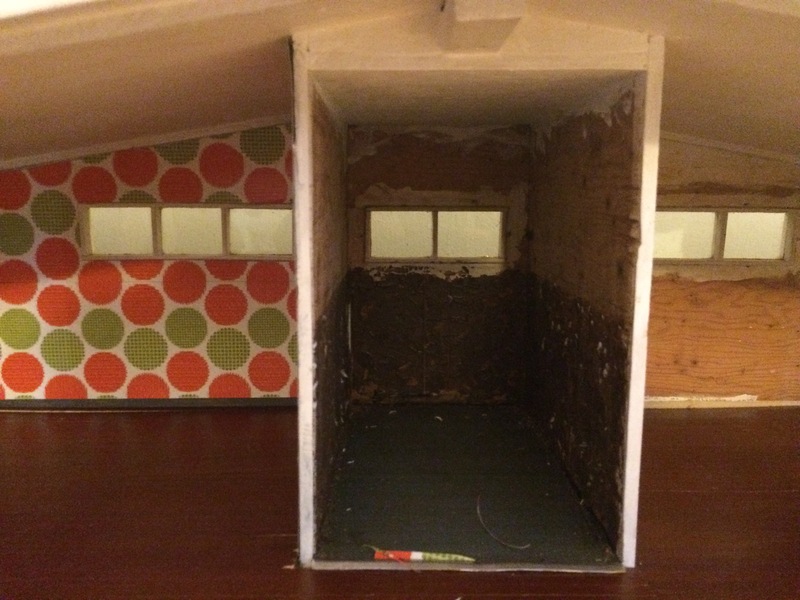 For all the details, and to see the final unveiling which will hopefully happen in the later spring/summer, follow me here on WordPress or on the Flip This Mini House Facebook page. I’ve been getting lots of work done! 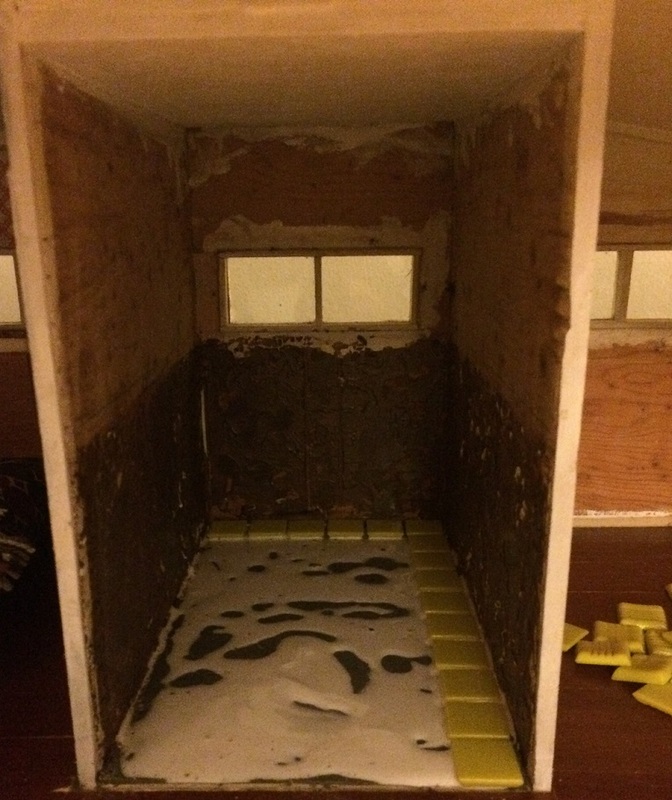 Progress in the mini bathroom. Photo by Holly Tierney-Bedord. All rights reserved. Bathroom floor installation, partway through. Photos by Holly Tierney-Bedord. All rights reserved. 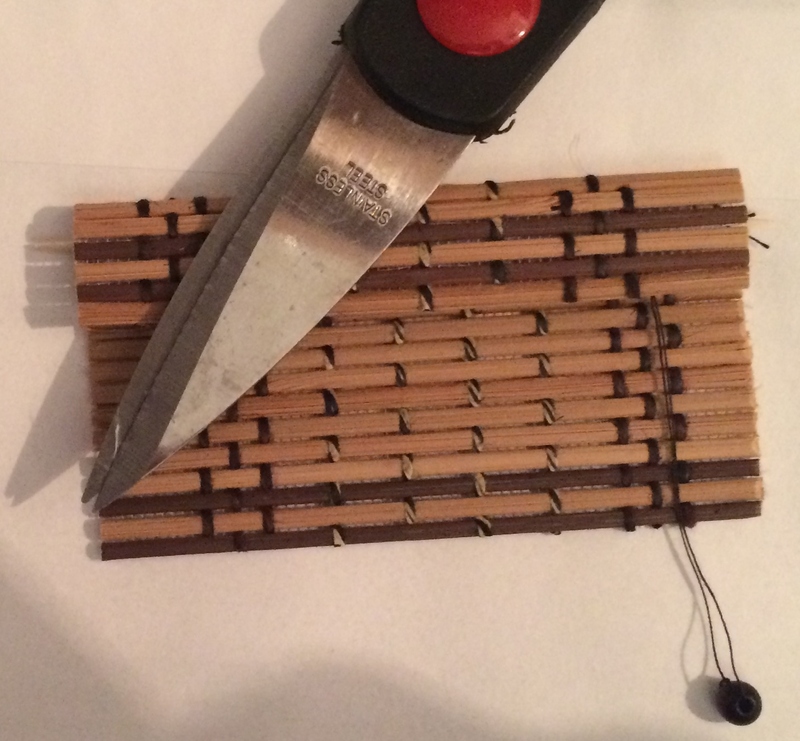 For information on making your own mini coaster blinds, take a look back at this post from a few weeks ago. I want my mid century house to feel homey and authentic, although it will be an updated, 21st century version of how a mid century house would look. This tiny mushroom and butterfly stitching project was created by me, but inspired by other 1960’s and 1970’s patterns I found online. 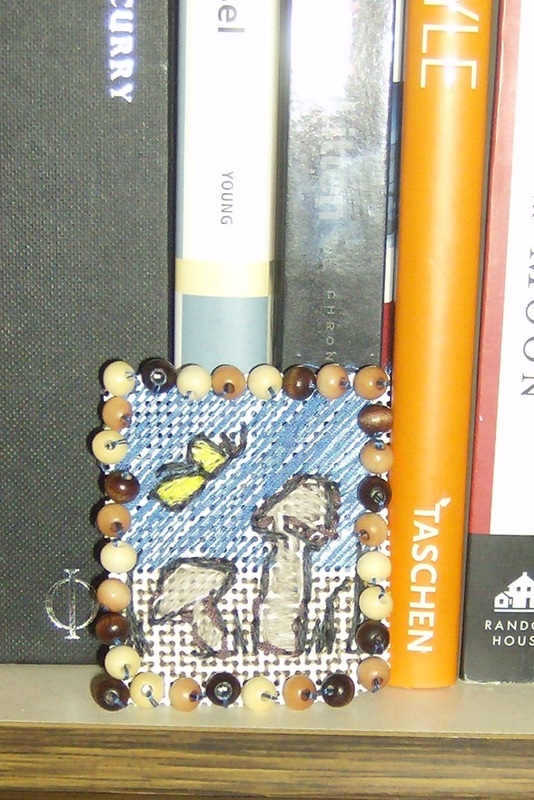 I drew the mushrooms and butterflies on a small piece of cross-stitch backing, filled them in with stitches, added some stitched blades of grass, and finished it off with a wood bead border. 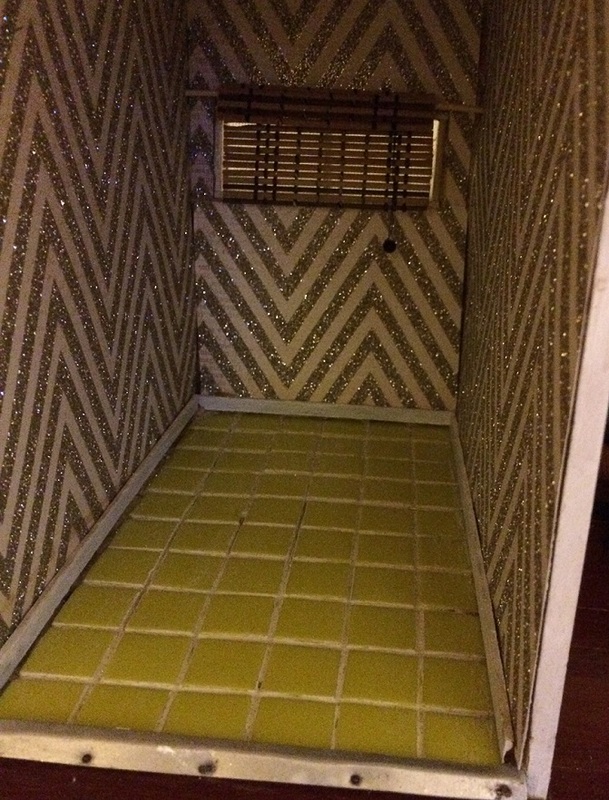 The whole project took just a couple of hours, and was mindlessly completed while watching television. If you’re going to watch TV, you might as while create something at the same time. Groovy mushrooms mini wallhanging. Photo by Holly Tierney-Bedord. All rights reserved. Everyday objects around your house can be repurposed in unique ways. I love these West Elm measuring cups I got from a friend, and now I have found a great way to show them off: The bigger measuring cups have joined a stack of small bowls in my (real life, full sized) kitchen, while the two smaller cups have been turned into cute planters for my dollhouse. 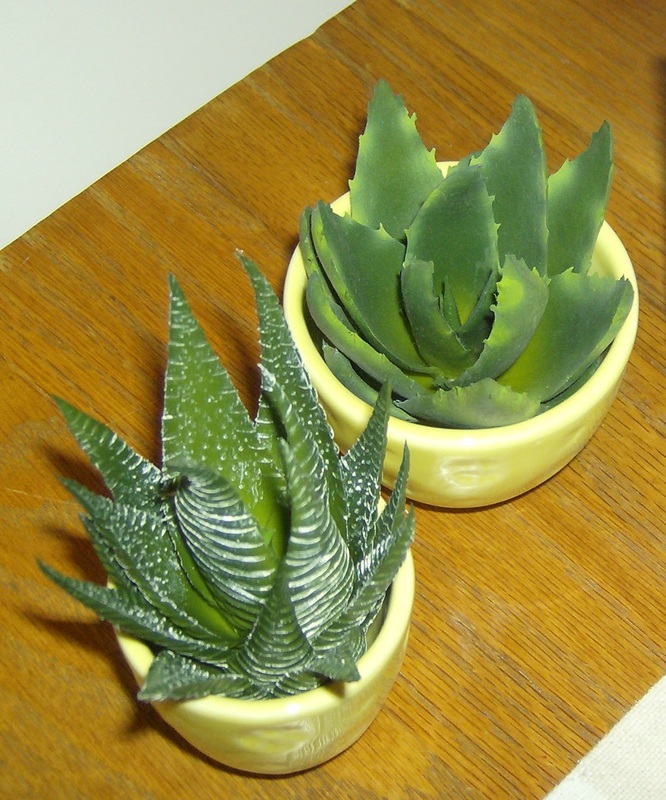 I paired them with some plastic succulents from the craft store to give them a whole new look. They’ll be cute by the front door, someday in the future when I get to that stage. The best part? This project took approximately 1 second to complete, cost very little, and has no long term effects on the measuring cups, in the event that I change my mind and want to return them to their former measuring cup status. West Elm measuring cups turned oversized planters. Photo by Holly Tierney-Bedord. All rights reserved. 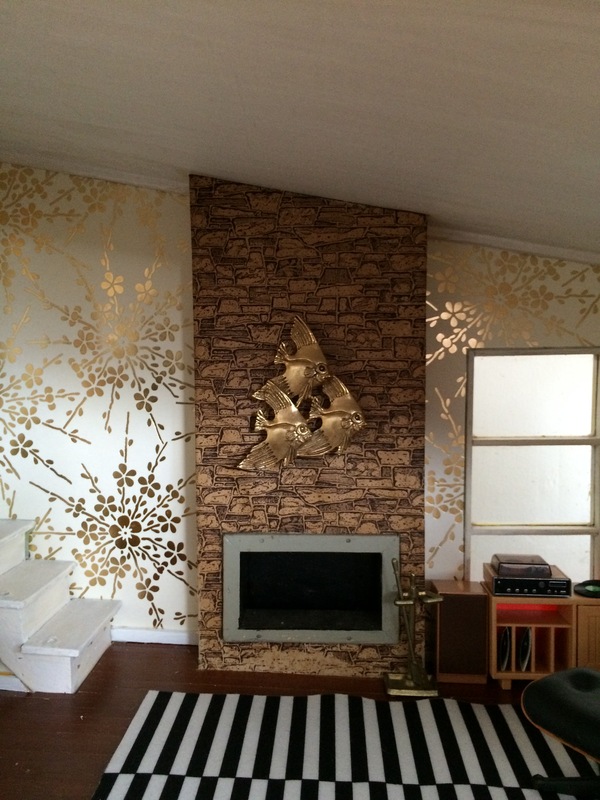 It’s nowhere near being move-in ready yet, but my mid-century marvel has been accumulating stacks of decor. Some of it I’ve purchased new, some at antique and thrift stores, but most of it I’ve made myself. This miniature macrame owl was inspired by Jonathan Adler’s design book 100 Ways to Happy Chic Your Life. 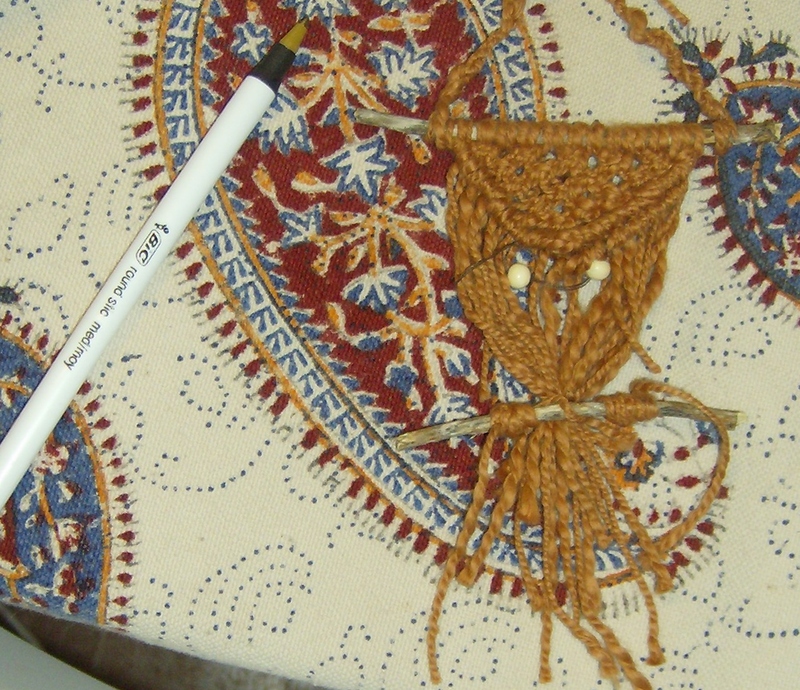 In the book he shows several macrame owls and gives simple, step-by-step instructions to create your own owl. I used his instructions as helpful guidelines, but altered them to work for me. I used thin yarn so it would be the appropriate scale. I added the eyes with slightly darker thread, and I will reattach them once I pick up some thread that’s a match. Up close and with the camera flash the thread is quite noticeable, but until I can replace it, it’s actually not that easy to see in person. I’ve shown the owl with a regular pen so you can get an idea of the scale. Once it’s hanging in the house it will look like a pretty large wallhanging. I think it will end up in the living room, but I am not sure yet. 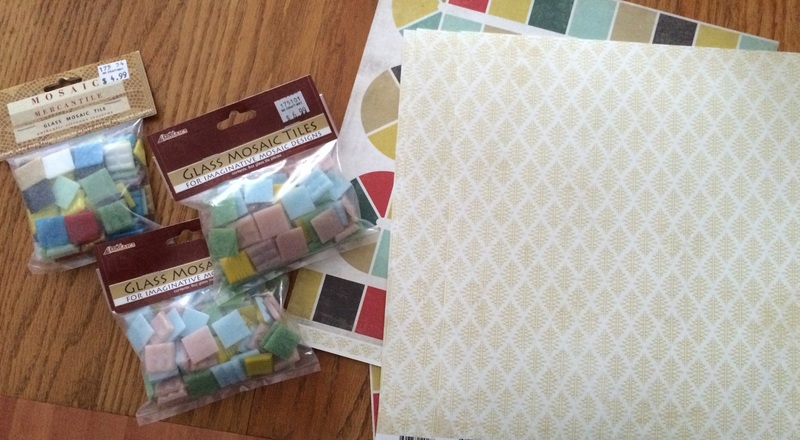 The best part about miniature crafts? They don’t take very long to make!